Angular JS is very useful for making the single page application, in present many company are using angular JS for creating the application. 1. Mainly the use of angular JS is that it is used to create the single page application. 2. It can prevent from the dependency injection. 3. One of the most feature or advantage of using Angular JS is that it provides the facility of Two-Way data binding means it keep connected data and model so any changes we can make data and it will update the model. 4. For testing purpose it is more good, basically angular JS is designed in way of testing, so for unit testing purpose it is nice. 5. Working with angular JS for developers, it gives many features with less work. 6. We can create a Angular JS application with the MVC way. 1. An Application with Angular JS is not a secured application, for making secure your application you need to put Authentication and authorization on server side. 1. ng-app :- It is directive ,there are many directive in angular JS, Directive means that bind the Angular JS Application with the HTML. Here ng means that it is belong to the angular JS. 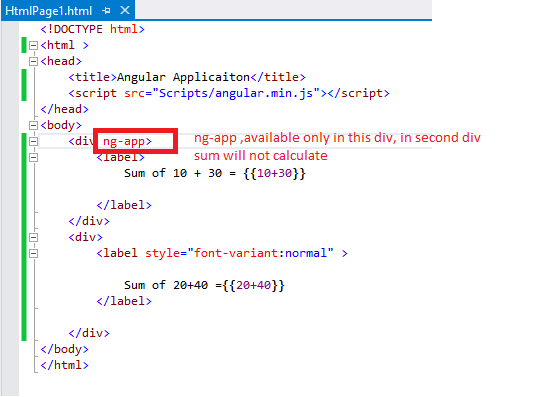 An application where are using the angular JS, first it find the “ng-app” on the page after that it work for all the section where this page find the directive. This ng-app is placed at the <HTML ng-app> tag level or the <Body ng-App> tag level so that it available for the entire page. 2. 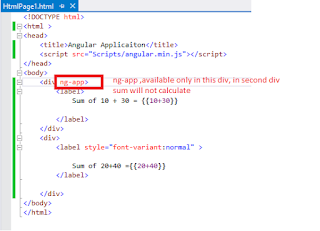 Ng-model:- :- It bind the Angular JS Application data to the HTML controls. 3. Ng-Bind :- It is used to bind the application data to the HTML tag. How to download the angular JS Script. 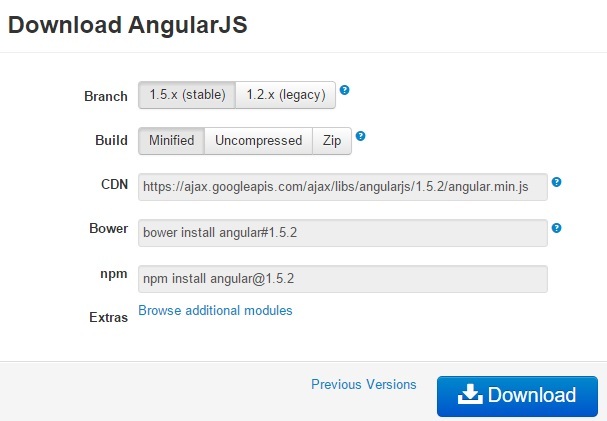 Better Caching : If you host AngularJS yourself, your users will have to download the source code atleast once. But if the browser sees that you are referring to Google CDN's version of AngularJS, and your user has visited another app which uses AngularJS, then he can avail the benefits of caching, and thus reduce one download, speeding up his overall experience! Decreased Latency : Google's CDN distributes your static content across the globe, in various diverse, physical locations. It increases the odds that the user gets a version of AngularJS served from a location near him, thus reducing overall latency. Increased Parallelism : Using Google's CDN reduces one request to your domain. Depending on the browser, the number of parallel requests it can make to a domain is restricted (as low as 2 in IE 7). So it can make a gigantic difference in loading times for users of those browsers. So now let’s we will understand this angular JS with a simple example. 3. Now right click on your application and add a HTML page. 4. Drag and drop angular JS Script to HTML page in head section . 5. Now add the ng-app directive to the HTML tag or body tag to that it is available through the page. Now write the following code and run your application and see the output in different cases.